A transfer RNA (abbreviated tRNA and archaically referred to as sRNA, for soluble RNA) is an adaptor molecule composed of RNA, typically 76 to 90 nucleotides in length, that serves as the physical link between the mRNA and the amino acid sequence of proteins. It does this by carrying an amino acid to the protein synthetic machinery of a cell (ribosome) as directed by a three-nucleotide sequence (codon) in a messenger RNA (mRNA). As such, tRNAs are a necessary component of translation, the biological synthesis of new proteins according to the genetic code. The specific nucleotide sequence of an mRNA specifies which amino acids are incorporated into the protein product of the gene from which the mRNA is transcribed, and the role of tRNA is to specify which sequence from the genetic code corresponds to which amino acid. One end of the tRNA matches the genetic code in a three-nucleotide sequence called the anticodon. The anticodon forms three base pairs with a codon in mRNA during protein biosynthesis. The mRNA encodes a protein as a series of contiguous codons, each of which is recognized by a particular tRNA. On the other end of the tRNA is a covalent attachment to the amino acid that corresponds to the anticodon sequence. Each type of tRNA molecule can be attached to only one type of amino acid, so each organism has many types of tRNA (in fact, because the genetic code contains multiple codons that specify the same amino acid, there are several tRNA molecules bearing different anticodons which also carry the same amino acid). The covalent attachment to the tRNA 3’ end is catalyzed by enzymes called aminoacyl tRNA synthetases. During protein synthesis, tRNAs with attached amino acids are delivered to the ribosome by proteins called elongation factors (EF-Tu in bacteria, eEF-1 in eukaryotes), which aid in decoding the mRNA codon sequence. If the tRNA's anticodon matches the mRNA, another tRNA already bound to the ribosome transfers the growing polypeptide chain from its 3’ end to the amino acid attached to the 3’ end of the newly delivered tRNA, a reaction catalyzed by the ribosome. The acceptor stem is a 7- to 9-base pair (bp) stem made by the base pairing of the 5'-terminal nucleotide with the 3'-terminal nucleotide (which contains the CCA 3'-terminal group used to attach the amino acid). The acceptor stem may contain non-Watson-Crick base pairs. The anticodon arm is a 6-bp stem whose loop contains the anticodon. The tRNA 5'-to-3' primary structure contains the anticodon but in reverse order, since 3'-to-5' directionality is required to read the mRNA from 5'-to-3'. Bases that have been modified, especially by methylation (e.g. tRNA (guanine-N7-)-methyltransferase), occur in several positions throughout the tRNA. The first anticodon base, or wobble-position, is sometimes modified to inosine (derived from adenine), pseudouridine or lysidine (derived from cytosine). An anticodon is a unit made up of three nucleotides that correspond to the three bases of the codon on the mRNA. Each tRNA contains a specific anticodon triplet sequence that can base-pair to one or more codons for an amino acid. Some anticodons can pair with more than one codon due to a phenomenon known as wobble base pairing. Frequently, the first nucleotide of the anticodon is one not found on mRNA: inosine, which can hydrogen bond to more than one base in the corresponding codon position. :29.3.9 In the genetic code, it is common for a single amino acid to be specified by all four third-position possibilities, or at least by both pyrimidines and purines; for example, the amino acid glycine is coded for by the codon sequences GGU, GGC, GGA, and GGG. Other modified nucleotides may also appear at the first anticodon position - sometimes known as the "wobble position" - resulting in subtle changes to the genetic code, as for example in mitochondria. To provide a one-to-one correspondence between tRNA molecules and codons that specify amino acids, 61 types of tRNA molecules would be required per cell. However, many cells contain fewer than 61 types of tRNAs because the wobble base is capable of binding to several, though not necessarily all, of the codons that specify a particular amino acid. A minimum of 31 tRNA are required to translate, unambiguously, all 61 sense codons of the standard genetic code. Aminoacylation is the process of adding an aminoacyl group to a compound. It produces a tRNA molecule with its CCA 3' end covalently linked to an amino acid. Certain organisms can have one or more aminoacyl tRNA synthetases missing. This leads to charging of the tRNA by a chemically related amino acid. An enzyme or enzymes modify the charged amino acid to the final one. For example, Helicobacter pylori has glutaminyl tRNA synthetase missing. Thus, glutamate tRNA synthetase charges tRNA-glutamine(tRNA-Gln) with glutamate. An amidotransferase then converts the acid side chain of the glutamate to the amide, forming the correctly charged gln-tRNA-Gln. 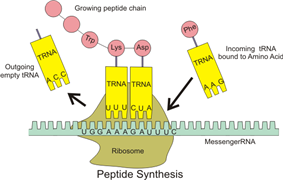 The ribosome has three binding sites for tRNA molecules that span the space between the two ribosomal subunits: the A (aminoacyl), P (peptidyl), and E (exit) sites. In addition, the ribosome has two other sites for tRNA binding that are used during mRNA decoding or during the initiation of protein synthesis. These are the T site (named elongation factor Tu) and I site (initiation). By convention, the tRNA binding sites are denoted with the site on the small ribosomal subunit listed first and the site on the large ribosomal subunit listed second. For example, the A site is often written A/A, the P site, P/P, and the E site, E/E. The binding proteins like L27, L2, L14, L15, L16 at the A- and P- sites have been determined by affinity labeling by A.P. Czernilofsky et al. (Proc. Natl. Acad. Sci, USA, pp 230–234, 1974). The P/I site is actually the first to bind to aminoacyl tRNA, which is delivered by an initiation factor called IF2 in bacteria. However, the existence of the P/I site in eukaryotic or archaeal ribosomes has not yet been confirmed. The P-site protein L27 has been determined by affinity labeling by E. Collatz and A.P. Czernilofsky (FEBS Lett., Vol. 63, pp 283–286, 1976). Organisms vary in the number of tRNA genetics studies, has 29,647  genes in its nuclear genome, of which 620 code for tRNA. The budding yeast Saccharomyces cerevisiae has 275 tRNA genes in its genome. In the human genome, which, according to January 2013 estimates, has about 20,848 protein coding genes  in total, there are 497 nuclear genes encoding cytoplasmic tRNA molecules, and 324 tRNA-derived pseudogenes—tRNA genes thought to be no longer functional (although pseudo tRNAs have been shown to be involved in antibiotic resistance in bacteria ). Regions in nuclear chromosomes, very similar in sequence to mitochondrial tRNA genes, have also been identified (tRNA-lookalikes). These tRNA-lookalikes are also been considered as part of the nuclear mitochondrial DNA (genes transferred from the mitochondria to the nucleus). Genomic tRNA content is a differentiating feature of genomes among biological domains of life: Archaea present the simplest situation in terms of genomic tRNA content with a uniform number of gene copies, Bacteria have an intermediate situation and Eukarya present the most complex situation. Eukarya present not only more tRNA gene content than the other two kingdoms but also a high variation in gene copy number among different isoacceptors, and this complexity seem to be due to duplications of tRNA genes and changes in anticodon specificity . In eukaryotic cells, tRNAs are transcribed by RNA polymerase III as pre-tRNAs in the nucleus. RNA polymerase III recognizes two highly conserved downstream promoter sequences: the 5' intragenic control region (5'-ICR, D-control region, or A box), and the 3'-ICR (T-control region or B box) inside tRNA genes. The first promoter begins at +8 of mature tRNAs and the second promoter is located 30-60 nucleotides downstream of the first promoter. The transcription terminates after a stretch of four or more thymidines. Pre-tRNAs undergo extensive modifications inside the nucleus. 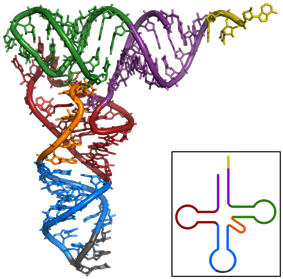 Some pre-tRNAs contain introns that are spliced, or cut, to form the functional tRNA molecule; in bacteria these self-splice, whereas in eukaryotes and archaea they are removed by tRNA-splicing endonucleases. The 5' sequence is removed by RNase P, whereas the 3' end is removed by the tRNase Z enzyme. A notable exception is in the archaeon Nanoarchaeum equitans, which does not possess an RNase P enzyme and has a promoter placed such that transcription starts at the 5' end of the mature tRNA. The non-templated 3' CCA tail is added by a nucleotidyl transferase. Before tRNAs are exported into the cytoplasm by Los1/Xpo-t, tRNAs are aminoacylated. The order of the processing events is not conserved. For example, in yeast, the splicing is not carried out in the nucleus but at the cytoplasmic side of mitochondrial membranes. ^ Plescia, O J; Palczuk, N C; Cora-Figueroa, E; Mukherjee, A; Braun, W (October 1965). "Production of antibodies to soluble RNA (sRNA)". Proc. Natl. Acad. Sci. USA 54 (4): 1281–1285. ^ a b c Sharp, Stephen J; Schaack, Jerome; Cooley, Lynn; Burke, Deborah J; Soll, Dieter (1985). "Structure and Transcription of Eukaryotic tRNA Genes". CRC Critical Reviews in Biochemistry 19 (2): 107–144. ^ a b Crick F (1968). "The origin of the genetic code". J Mol Biol 38 (3): 367–379. ^ a b Stryer L, Berg JM, Tymoczko JL (2002). Biochemistry (5th ed.). San Francisco: W.H. Freeman. ^ a b c d e f Itoh, Yuzuru; Sekine, Shun-ichi Sekine; Suetsugu, Shiro; Yokoyama, Shigeyuki (6 May 2013). "Tertiary structure of bacterial selenocysteine tRNA". Nucleic Acids Research 41 (13): 6729–6738. ^ Goodenbour, J. M.; Pan, T. (29 October 2006). "Diversity of tRNA genes in eukaryotes" (PDF). Nucleic Acids Research 34 (21): 6137–6146. ^ Jahn, Martina; Rogers, M. John; Söll, Dieter (18 July 1991). "Anticodon and acceptor stem nucleotides in tRNAGln are major recognition elements for E. coli glutaminyl-tRNA synthetase". Nature 352 (6332): 258–260. ^ Ibba, Michael; Söll, Dieter (June 2000). "Aminoacyl-tRNA Synthesis". Annual Review of Biochemistry 69 (1): 617–650. ^ McCloskey, James A.; Nishimura, Susumu (November 1977). "Modified nucleosides in transfer RNA". Accounts of Chemical Research 10 (11): 403–410. ^ Felsenfeld G, Cantoni G; Cantoni (1964). "Use of thermal denaturation studies to investigate the base sequence of yeast serine sRNA". Proc Natl Acad Sci USA 51 (5): 818–26. ^ Suzuki, T; Suzuki, T (June 2014). "A complete landscape of post-transcriptional modifications in mammalian mitochondrial tRNAs.". Nucleic acids research 42 (11): 7346–57. ^ Schimmel P, Giege R, Moras D, Yokoyama S; Giege; Moras; Yokoyama (1993). "An operational RNA code for amino acids and possible relationship to genetic code". Proc. Natl. Acad. Sci. USA 90 (19): 8763–876. ^ Dunkle JA, Wang L, Feldman MB, Pulk A, Chen VB, Kapral GJ, Noeske J, Richardson JS, Blanchard SC, Cate JH; Wang; Feldman; Pulk; Chen; Kapral; Noeske; Richardson; Blanchard; Cate (2011). "Structures of the bacterial ribosome in classical and hybrid states of tRNA binding". Science 332 (6032): 981–984. ^ Konevega, AL; Soboleva, NG; Makhno, VI; Semenkov, YP; Wintermeyer, W; Rodnina, MV; Katunin, VI (Jan 2004). "Purine bases at position 37 of tRNA stabilize codon-anticodon interaction in the ribosomal A site by stacking and Mg2+-dependent interactions". RNA 10 (1): 90–101. ^ a b Agirrezabala X, Frank J; Frank (2009). "Elongation in translation as a dynamic interaction among the ribosome, tRNA, and elongation factors EF-G and EF-Tu". Q Rev Biophys 42 (3): 159–200. ^ a b Allen GS, Zavialov A, Gursky R, Ehrenberg M, Frank J; Zavialov; Gursky; Ehrenberg; Frank (2005). "The cryo-EM structure of a translation initiation complex from Escherichia coli". Cell 121 (5): 703–712. ^ WormBase web site, http://www.wormbase.org release WS187, date 25-Jan-2008. ^ Spieth, J; Lawson, D (Jan 2006). "Overview of gene structure". WormBook: 1–10. ^ a b Lander E.; et al. (2001). "Initial sequencing and analysis of the human genome". Nature 409 (6822): 860–921. ^ Rogers Theresa E.; et al. (2012). "A Pseudo-tRNA Modulates Antibiotic Resistance in Bacillus cereus". PLoS ONE 7 (7): e41248. ^ a b Telonis Aristeidis G.; et al. (2014). "Nuclear and Mitochondrial tRNA-lookalikes in the Human Genome". Frontiers in Genetics 5: 00344. ^ a b c Novoa, Eva Maria; Pavon-Eternod, Mariana; Pan, Tao; Ribas de Pouplana, Lluís (March 2012). "A Role for tRNA Modifications in Genome Structure and Codon Usage". Cell 149 (1): 202–213. ^ White RJ (1997). "Regulation of RNA polymerases I and III by the retinoblastoma protein: a mechanism for growth control?". Trends in Biochemical Sciences 22 (3): 77–80. ^ Sharp, Stephen; Dingermann, Theodor; Söll, Dieter (1982). "The minimum intragenic sequences required for promotion of eukaryotic tRNA gene transcription" (PDF). Nucleic Acids Research 10 (18): 5393–5406. ^ a b Dieci G, Fiorino G, Castelnuovo M, Teichmann M, Pagano A; Fiorino; Castelnuovo; Teichmann; Pagano (December 2007). "The expanding RNA polymerase III transcriptome". Trends Genet. 23 (12): 614–22. ^ Tocchini-Valentini, Giuseppe D.; Fruscoloni, Paolo; Tocchini-Valentini, Glauco P. (12 November 2009). "Processing of multiple-intron-containing pretRNA". Proceedings of the National Academy of Sciences 106 (48): 20246–20251. ^ Abelson J, Trotta CR, Li H; Trotta; Li (1998). "tRNA Splicing". J Biol Chem 273 (21): 12685–12688. ^ Frank DN, Pace NR; Pace (1998). "Ribonuclease P: unity and diversity in a tRNA processing ribozyme". Annu. Rev. Biochem. 67 (1): 153–80. ^ Ceballos M, Vioque A; Vioque (2007). "tRNase Z". Protein Pept. Lett. 14 (2): 137–45. ^ Randau L, Schröder I, Söll D; Schröder; Söll (May 2008). "Life without RNase P". Nature 453 (7191): 120–3. ^ Weiner AM (October 2004). "tRNA maturation: RNA polymerization without a nucleic acid template". Curr. Biol. 14 (20): R883–5. ^ Kutay, U. .; Lipowsky, G. .; Izaurralde, E. .; Bischoff, F. .; Schwarzmaier, P. .; Hartmann, E. .; Görlich, D. . (1998). "Identification of a tRNA-Specific Nuclear Export Receptor". Molecular Cell 1 (3): 359–369. ^ Arts, G. J.; Fornerod, M. .; Mattaj, L. W. (1998). "Identification of a nuclear export receptor for tRNA". Current Biology 8 (6): 305–314. ^ Arts, G. -J.; Kuersten, S.; Romby, P.; Ehresmann, B.; Mattaj, I. W. (1998). "The role of exportin-t in selective nuclear export of mature tRNAs". The EMBO Journal 17 (24): 7430–7441. ^ Yoshihisa, T.; Yunoki-Esaki, K.; Ohshima, C.; Tanaka, N.; Endo, T. (2003). "Possibility of cytoplasmic pre-tRNA splicing: the yeast tRNA splicing endonuclease mainly localizes on the mitochondria". Molecular Biology of the Cell 14 (8): 3266–3279. ^ Brian F.C. Clark (October 2006). "The crystal structure of tRNA" (PDF). J. Biosci. 31 (4): 453–7. ^ HOLLEY RW; APGAR J; EVERETT GA; et al. (March 1965). "STRUCTURE OF A RIBONUCLEIC ACID". Science 147 (3664): 1462–5. ^ Ladner JE; Jack A; Robertus JD; et al. (November 1975). "Structure of yeast phenylalanine transfer RNA at 2.5 A resolution". Proc. Natl. Acad. Sci. U.S.A. 72 (11): 4414–8. ^ Kim SH; Quigley GJ; Suddath FL; et al. (1973). "Three-dimensional structure of yeast phenylalanine transfer RNA: folding of the polynucleotide chain". Science 179 (4070): 285–8.